So my first attempt at a Cook Wise recipe didn’t go so well. While I haven’t retaken the Raised Waffles exam, I have aced the Salmon Fillet with Mustard quiz. It’s quite similar to the Honey Mustard Chicken Breast that we like so much here at BAH. But quicker. And who doesn’t love a quick recipe? While I could use that extra time to study up on the Raised Waffles, my assigned reading this week is The Sweet Life In Paris. And I think there’s going to be a pop quiz coming up so I need to be ready. Preheat the oven to 375 degrees and line a sheet pan with aluminum foil. Bring the apple juice to a boil in a small saucepan over medium high heat until reduced to approximately 1/4 cup. Whisk in the mustard and dill and remove from the heat. Pat the fish dry with paper towels and place (skin side down if applicable) on the baking sheet and season with salt. 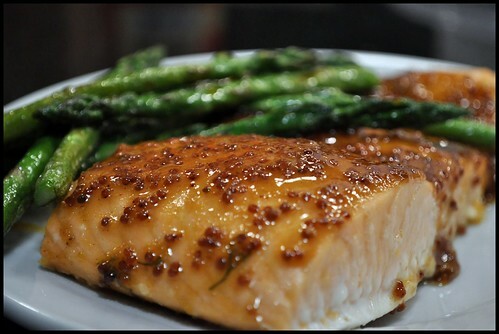 Spoon the apple juice mixture over the fish and bake for 10 to 15 minutes until the fish flakes easily with a fork.